Northland Painters are one of only a few NZ companies that will guarantee the paint work we complete in swimming pools for five years. The secret is in the preparation! If the surface of the pool is prepared properly, it will last for years. If it isn’t, you could find that there is a lot of paint in the pool! 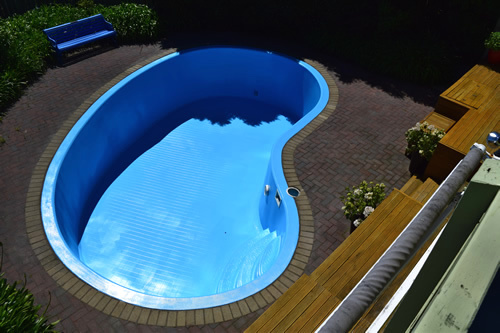 We only use quality Altex epoxy paint as this is the best in New Zealand for pools. They come in a large range of colours, so we’re sure we can find one to suit you. 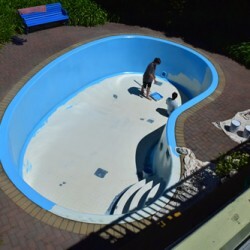 We carry out on-site inspections before starting a pool painting project. Please contact us about a free quote to get your pool painted. Our workmanship is of the highest standard. We only use Altex products to their guidelines. We discuss any variations with you prior to starting. We keep your pool area tidy during our work and will consult with you any questions of where to clean brushes and so on. Time to complete the job will vary depending on your requirements but we will give you an indication of this when we discuss your needs. My name is Kevin Spellman and I have just had my in ground fibreglass pool painted by Peter Schwarz of Northland Painters. I have to say that we were all impressed with the quality and high standard of workmanship that was applied here. The quote was sharp to begin with, and then sanding and preparation before painting was detailed and careful. Next clear coat sealer was applied, and also covered jointing sand which locked in pavers to the fibreglass pool edge. More light sanding. Then 1st coat of fibreglass paint of our colour choice. More light sanding. Finally 2nd coat of blue paint. This 38,500 litre pool is about 30 years old and was bleached white with years of sun, chlorine and countless neighbourhood kids. Now thanks to Peter it is revitalised and deep blue. My family and I would like to congratulate you on your skilled and talented staff.